My son (age 13) and I had the pleasure of using Uzzingo, an awesome online math and science program. This is our review of their offerings. First off, I should admit that our family is biased towards online modes of learning. Both of my children learn well through non-traditional methods such as videos and apps. So we approached the Uzinggo learning modules with excitement and enthusiasm. We were not disappointed! Uzinggo offers digital instruction in middle-school and high- school math and science along with many supplemental resources to help any child succeed in even the toughest math and science courses. 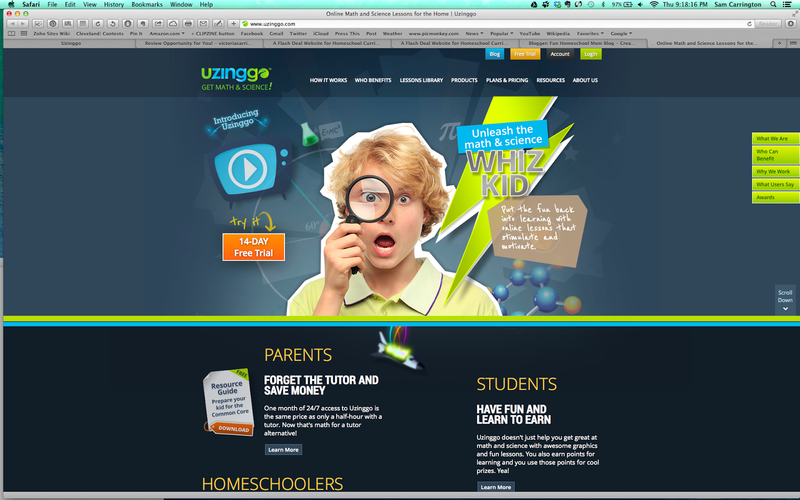 Uzinggo's tag line, "Put the fun back into learning with online lessons that stimulate and motivate." proved true for us. My son enjoyed the science lessons and said they compared favorably to Brain Pop because they were more interactive. The only drawback that my son noted was that he wished Uzinggo had more topics! My son liked being able to pick and choose topics that he was interested in from the science area. He liked the depth of knowledge presented. As the homeschool mom/teacher, I was very impressed with the teacher resources available, particularly for the math lessons. For a student having difficulty with the self-paced tutorials, Uzinggo offers very detailed teacher guides to allow me to help with any topic. Also included are supplemental worksheets and quizzes that can be printed out as needed. Also, I like having a record of his progress, including how much time was spent on each subject and assessment of knowledge. Overall, we are very pleased with Uzinggo and I would recommend the program for any homeschool parent or parent who would like to supplement their child's math and science learning at home. A free trial is available. Great news for those who would like to purchase a year's worth of Uzinggo lessons! I have a promo code that will allow you to save 20%. Please read below. Uzinggo is running a holiday/gift giving promotion of 20% off annual subscriptions! Disclosure: I was given a subscription to Uzinggo for review however the opinions in this review are my own.